THIS PAST WEEK, I'VE BEEN WATCHING THE PBS SERIES, ART:21. I'M PART WAY THROUGH SEASON TWO AND REALLY ENJOYING IT. REALLY GOOD TO SEE MARGARET KILGALLEN IN ACTION, AN IMPORTANT PART OF THE WEST COAST NEO LOW-BROW MOVEMENT. 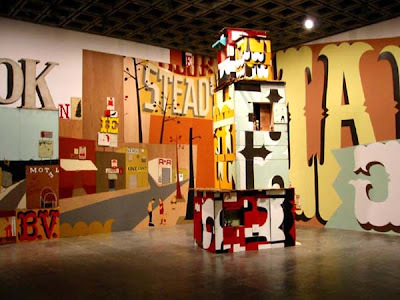 NZ GOT A BIT OF A TASTE OF KILGALLEN -TYPE WORK WHEN NICKY DEELEY PAINTED A LARGE MURAL IN THE DUNEDIN PUBLIC ART GALLERY IN 2006. KILGALLEN DIED IN 2001, AGED 33.